Home Doraemon The Movie: IN HINDI Full (HD) Doraemon In Dorabian Nights Full Movie In Hindi ! Doraemon In Dorabian Nights In Hindi Watch Online! STORY: With Doraemon's "Storybook Shoes" invention, he and Nobita, Gian, Suneo and Shizuka explore inside different storybooks. 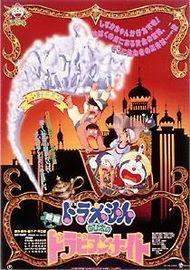 Later, Shizuka goes missing in a Arabian Nights story. Doraemon and Nobita decide to go into the storybook to find her, but their plan backfires when Nobita's mother burns all of the books. So Doraemon, Nobita, Gian and Suneo go back in time to the Arabian country to search for her. Will they be able to overcome the dangers they will encounter? Did You Enjoyed Dorameon The Movie Nobitas Dorabian Nights On Disney ?